An upcoming round of high-level talks between the U.S. and North Korea has been postponed, the Department of State announced early Wednesday morning. The meeting between Secretary of State Mike Pompeo and North Korean official Kim Yong Chol, which had been scheduled for Thursday in New York, “will now take place at a later date,” department spokesperson Heather Nauert said in a statement. Nauert did not provide a specific reason for the cancellation of Thursday’s meeting, which had been touted as a warm-up for a second summit between President Donald Trump and North Korean leader Kim Jong Un in early 2019. Just days ago, Pompeo said he expected to achieve “some real progress” on nuclear disarmament during the meeting with Kim Yong Chol. Instead, the ongoing nuclear talks appear to have hit another snag over major differences in how to proceed with the denuclearization process. North Korea has demanded that any moves it makes toward dismantling its nuclear weapons program must be accompanied by international sanctions relief, while the Trump administration insists the sanctions remain in force until complete denuclearization can be verified. 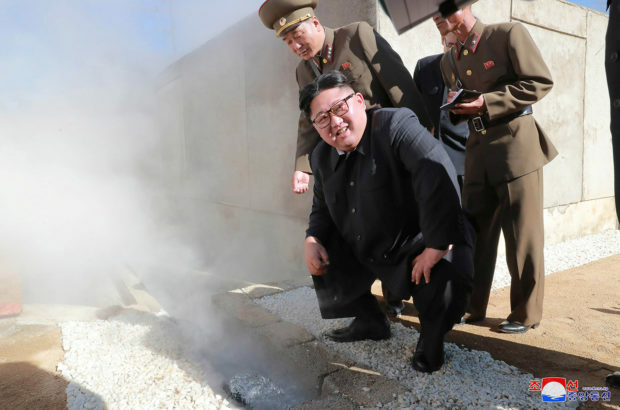 North Korean leader Kim Jong Un inspects a constructions site of Yangdeok, in this undated photo released on October 31, 2018 by North Korea’s Korean Central News Agency (KCNA). KCNA/via REUTERS. The postponement of Pompeo’s meeting with Kim Yong Chol is not the first time the secretary of state has nixed a high-level dialogue with North Korean leaders at the last minute. Trump abruptly canceled Pompeo’s trip to North Korea in August, citing a lack of progress on denuclearization talks. Despite the setbacks, Trump has put a positive spin on the ongoing negotiations, arguing that his personal relationship Kim Jong Un will help the two sides reach a deal. But the optimism generated by Trump’s historic summit with Kim earlier in 2018 has faded in recent months, as working-level meetings have failed to produce any breakthroughs. The Trump administration’s special envoy for North Korea negotiations, Stephen Biegun, has been unable to secure a meeting North Korean Vice Foreign Minister Choe Son Hui, the head of Pyongyang’s working-level delegation. Pyongyang warned Friday it could begin to strengthen its nuclear arsenal if Washington doesn’t change its position on sanctions relief.